Solar power systems contain several components which work together to convert the sun's energy into electrical power that can be connected to a building’s standard electrical infrastructure and/or the utility grid. The following are the some of the major parts of a typical solar power system instalment. Solar cells are the basic building block of a solar power system. 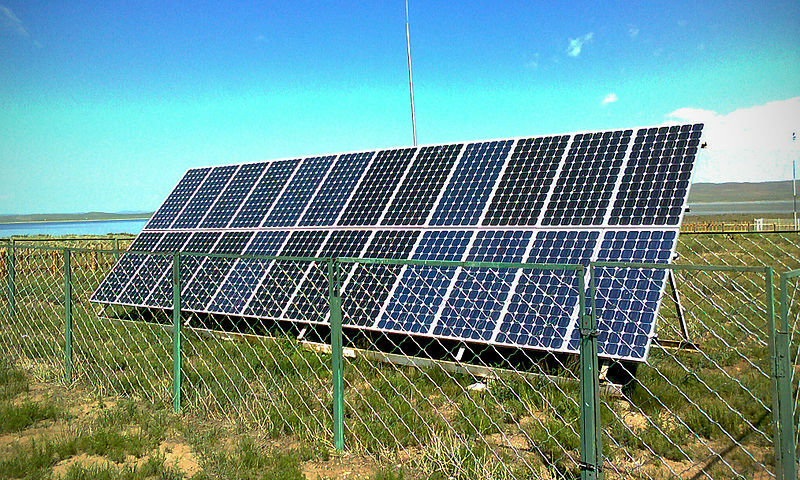 PV cells convert the sun’s energy into electricity (PHOTO VOLTAIC EFFECT). Solar cells are small, square-shaped semiconductors made from silicon and/or other conducting materials.When sunlight strikes a solar cell, the energy of the photon is given to the atoms there by release the valence electrons (If sufficient energy is provided), generating electric current. Solar cells are also called photo-voltaic cells or "PV cells" and can be found on many small and day-to-day appliances such as calculators, torch lights et al. A PV cell is most often made of a thin wafer of silicon modified with small amounts of other materials that give the silicon wafer special electrical properties. PV cells are connected together in a solar module, which has a non-reflective glass front, a protective insulating back sheet and an aluminium frame for strength and mounting. Solar panels are groups/modules of PV cells connected electrically. They generate direct current (DC) at the desired voltage. Panels are generally installed on rooftops or in open places with lot of sunlight, such as parking lots or fields. (Solar panels can collect solar energy even on cloudy days but the power output will be considerably less). A larger grouping of solar panels constitutes a “solar array.” Large non-residential solar facilities often contain multiple arrays, sometimes located on different buildings at a given site. The Combiner Box just as the name suggests combines all the DC outputs coming from each panel.It is an electrical distribution box where the DC circuit breakers are placed. It combines the multiple DC inputs coming from the panel terminations and converts these into one DC output wire of large capacity. The output of the combiner box is generally connected to the inverter. The correct combiner box for the system can be selected depending on the power requirements. An Inverter transforms direct current (DC) electricity produced by the solar panels into an alternating current (AC) electricity, the form of electricity used by most standard appliances in our houses like lights, computers, air conditioners etc., The inverter also provides safety functions such as automatic shut-down of the solar electric system in the event of a power failure to avoid backfiring (also called Panel Backlash) of Solar panels. An AC safety switch (also called Disconnect switch) is a manual switch that can be used to disconnect (if required to) the entire buildings electrical system from the solar power system. This is used as a security measure to shift loads during peak hours or during a heavy surge in the power that can damage the components of the system. PMRS stands for 'Performance Monitoring & Reporting System'. The entire solar power system is linked to a remotely located PMRS (Wired or Wireless). PMRS continuously measures and monitors and keeps track of all the electricity generated by the system. It performs system diagnostics and sends alerts regarding system or equipment issues. The PMRS also tracks weather and generates reports that link weather conditions to kilowatt-hour output. PMRS is very essential to get the maximum possible output from the solar panels, since panels are very sensitive to atmospheric changes and if not taken care the output keeps reducing day by day. So, All these components if work as they should, we will have power generated from the solar energy which is a great way of helping environment. So, if you are planning on installing a solar power grid system in your house or your building then don't wait, install them right away.